Creativity. Innovation. Success. That's Disney Imagineering. It was the Imagineers who brought Walt Disney's dreams to life. Now you can tap into the principles of Imagineering to make your personal and professional dreams come true. 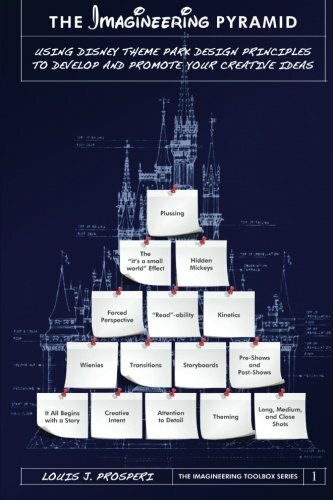 Even if you're not building a theme park, the Imagineering Pyramid can help you plan and achieve any creative goal. Lou Prosperi designed the pyramid from the essential building blocks of Disney Imagineering. He teaches you how to apply the pyramid to your next project, how to execute each step efficiently and creatively, and most important, how to succeed. How to use "The Art of the Show" to stay focused on your mission. Practical tutorials for each of the fifteen building blocks that make up the pyramid. Creative Intent, Theming, "Read"-ability, Kinetics, Plussing, and other Imagineering concepts. Imagineering beyond the berm: how to apply the pyramid to fields as diverse as game design and executive leadership. An "Imagineering Library" of books to further your studies. UNLEASH YOUR CREATIVITY WITH THE DISNEY IMAGINEERS!